NJLS Same Day delivers on the same day anywhere in the New Jersey, greater Philadelphia and New York City area for prices up to 60% less compared to the competition. NJLS Same Day is for any delivery, anytime, anywhere when time is of the essence and assured delivery is critical—that is 24/7 and 365 days a year. NJLS processes more than 3 million documents and packages annually and has two locations in New Jersey: our headquarters in Union and a facility in Cherry Hill, which serves the southern part of the state and Pennsylvania. When delivering documents or packages for businesses, we quickly and cost-effectively get their jobs done, inspiring confidence in our expertise. NJLS Same Day delivers at prices up to 60% less compared to competing couriers’ same-business day deliveries. Every same say delivery is backed up by a signed receipt and certificate or proof of service suitable for court filing as required. And, as permitted by courthouse security rules in effect, we deliver directly to judge chambers, clerk parts and administrator offices. 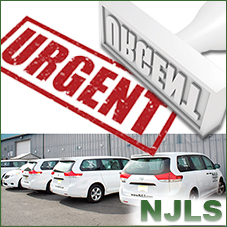 NJLS offers an online Same Day request form. Just sign in to you NJLS account, click on Same Day Service and fill in the delivery information you are requesting. You’ll get an instant quote on our service! You can also call us at 908-686-7300, menu option 3 to speak with one of our Same Day dispatch experts. Many of our professional couriers are also licensed NJ and NY Notaries. If your delivery requires a signature notarized and returned to your office, just tell our representative when you call. For more information about NJLS Same Day, please download the PDF. To review terms and conditions of NJLS Same Day offerings, please see our Services Guide.